I read this article and found it very interesting, thought it might be something for you. The article is called Hook of the Week: Etsy Store and is located at https://copychief.com/hook-of-the-week-etsy-store/. Kevin here with another smokin’ Hook of the Week… and man, this is a good one. If you want to know how long it should take you to write a really good 60-Second Sales Hook, this HoW should answer that question. If you’re not familiar with Etsy, it’s a digital marketplace for artists of all types. 60-Second Sales Hook subscriber, David, promotes his digital photo service there and used the formula to craft his hook and submitted it to me before creating a video using the 60-Second Sales Video Maker. In his original version, David follows the formula well, but uses the wrong struggle and a weak discovery and call to action. I suggested changes, but offer very little specifics, just where to add the information I’m suggesting. David replies, just hours later with a stunning rewrite of the hook that nails every one of my recommendations. He even got out of his comfort zone and called himself a “nerd” and created a vivid portrait of himself and what makes his work unique among a crowded field. I get excited by action-takers like David because they prove that we do our best work by instinct… and that over-thinking and hand-wringing never improve your writing, they simply stand in the way. So here is the private email exchange between David and I, plus a link to his new Etsy “about page. My hat off to you, David. Excellent work. I recently purchased your 60 second video sales maker and starting practising the KLT hook. the KLT hook, I could see myself applying to my Etsy “about me / my shop”, product descriptions, related marketing. Created a KLT hook this morning related to my Etsy “about me” and wondered about your thoughts on it. vintage images, like old maps, photos and book illustrations, one of my own passions. jewellery makers and various other crafters. please take a browse through Ye old Digital Prints, discover something new today. Thank you very much for your assistance and the idea for my hook, I really appreciate it. connect with other people in different parts of the world especially the USA (I`m from Scotland). IDENTITY: Hi I`m David a 37 year old digital print nerd from a wee corner of Scotland. STRUGGLE: For a long time I struggled to work out how to transform old vintage prints into something suitable that crafters could use in their projects. DISCOVERY: Then I discovered a whole new world of scrap booking templates and digital creation techniques that has opened up many new opportunities. RESULT: Now I have the ability to transform old vintage prints into inspiring and useful digital craft supplies that are used by scrap bookers, paper crafters, jewellery makers, and many others. Actually just started the digital prints a couple weeks ago after coming across them on etsy but have been creating / editing images on computer for over the years. A bit of a nerd with technology and tools both old and new but did struggle to find out how to create suitable digital prints at first – the web is an awesome learning tool. I can see the above hook in a slide video with some images of scrapbook templates and examples of digital prints. Pretty amazing transformation, eh? I’d say David made excellent use of his Saturday afternoon. 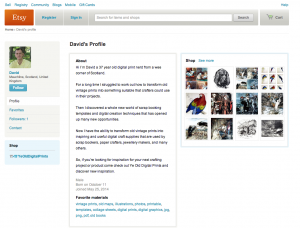 Here’s David’s About page on Etsy, and you can visit him here to check out some of his art. If you’ve got a KLT in Action that you’d like to see featured here, pop it in the comments below of send it to contact [at] 60secondsaleshook.com. Great job, its so laser targeted to fellow “print nerds”, speaks directly to specific interests, then hooks you in wanting to know more. Awesome , love it. Good luck with it! This was very helpful. Thank you Kevin. All credit goes to David, Marcin. Glad you liked it. Massive improvement! Way to take constructive criticism and make something great out of it, David. You’re going to sell a lot more with that new hook. Thanks for sharing, Kevin! Thanks for your comments, Beau! And I’d love to see a KLT for children’s book authors. Wanted to say thank you and appreciate the ideas and encouragement. Thanks for the ideas, just got started with creating facebook fanpage other day, so still finding way around. Found out etsy has way to hook up with facebook so whenever I add new item gives me option to post there. Perhaps the photo gallery would be handy for your idea on smaller examples – I`ll try out a couple of things today. David, the page looks fantastic now. Great work getting the video live so fast, eoo. I think it works without a voice over but would love to hear you on it as well. If you’re not comfortable adding your own voice, you could hire a Scottish voice over artists very inexpensively. Check Fiverr and voices.com. Next, start thinking of a special offer (10% off for new customers?) and test a facebook ad to it. Wow! What a huge difference indeed! Thats just awesome Kevin, in fact Davids hook is so good I’d like to use it to write my own hook for my art, and for my book I’m writing at the moment thats due out later this year. That hook have hooked me! Made me really interested to know more about David & what he does. Thanks for checking out my facebook page and for the ideas. I actually redid the video again with my own voice over but between the microphone level and conversion lost some of the sound level. Will redo again once sort out the mic issue. You can check out the unlisted voice over video here http://youtu.be/Z7uXUaMGNRM – you can hear me just need to turn volume up. Actually just added some coupons a multiple purchase and a surprise thank you 10% off next purchase – etsy has handy coupon creator on there site, makes it easier. Made a new version of the video with better sound and own voice – you can check it out here on youtube http://youtu.be/BE_QNcbh8Rk – any feedback is appreciated.